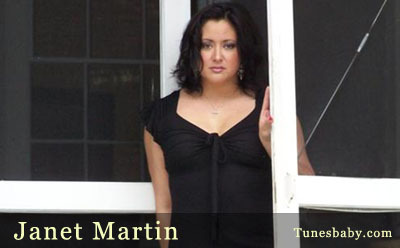 JANET MARTIN, SINGER/SONGWRITER, HAS SHARED THE STAGE WITH BRAD PAISLEY, TRACY BYRD, TRACY LAWRENCE, JON CONLEE, REBA MCENTIRE, AND GUITARIST BOB SAXTON. JANET HAS BEEN FEATURED NATIONALLY AS WWW.LISTENERSTATION.COM'S 'LIMELIGHT' ARTIST OF THE MONTH ON OVER 500 RADIO STATIONS ACROSS THE COUNTRY, AND IN THE NATIONAL PUBLICATION, A&R REGISTRY. JANET'S VIDEOS 'STRONGER THAN LOVE' AND “HEART TO A FOOL” ARE FEATURED ON “THE VENUE” ON KYES 5 IN ANCHORAGE, AND ON FRONTIER AIRLINES. SHE HAS BEEN HONORED TO DONATE HER TIME AND TALENTS TO MANY NON-PROFIT ORGANIZATIONS SUCH AS AWAIC, CMN, AND YWCA. SHE HAS BEEN INVITED FOR RETURN PERFORMANCES FOR THE MS. ALASKA/MISS TEEN USA PAGEANT, THE ALASKA ACES, ALASKA FIGHTING CHAMPIONSHIPS, AND THE THURSDAY NIGHT FIGHTS JUST TO NAME A FEW. JANET'S PIPES BRING A DELICIOUS BLEND OF ROCK AND R&B SOUND TO COUNTRY MUSIC THAT HAS TURNED MANY NON-COUNTRY MUSIC LOVERS TO ENJOY COUNTRY MUSIC FOR THE FIRST TIME! JANET’S WRITING AND VOCAL ABILITY WILL BRING YOU INTO THE STORY OF EACH SONG AND LEAVE YOU WANTING MORE! JANET'S MUSIC CAN BE FOUND ON OVER 45 MP3 SITES, INCLUDING APPLE ITUNES, ITUNES EUROPE, RHAPSODY, MUSICNET, NAPSTER, AND MUSICMATCH. CHECK OUT JANET’S OFFICIAL SITE FOR UPDATED INFORMATION ON HER NATIONAL TOUR, PURCHASING MERCHANDISE, VIDEOS, AND MORE!